As a lifelong radio hobbyist and professional, I have had the opportunity to check out many types of consumer radios, from the tube sets of the 40′s and 50′s through transistorized radios from the late 50′s and 60′s up through the present day offerings from China. 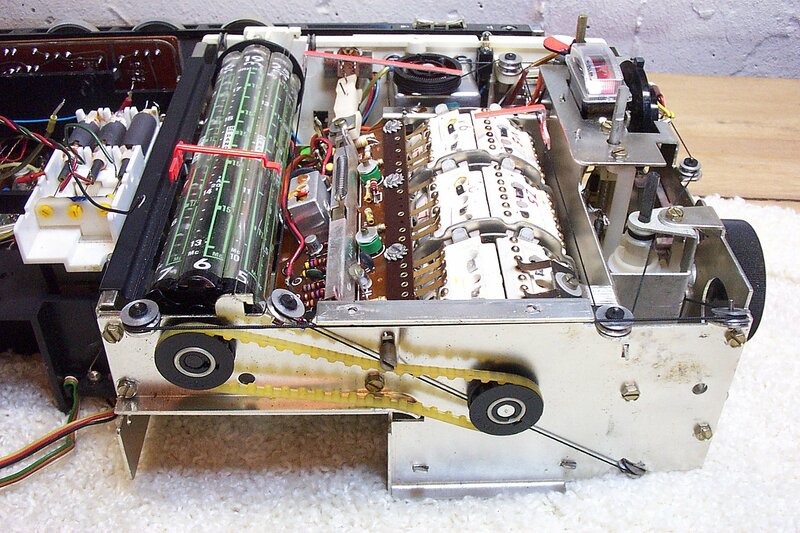 The Grundig Satellit 800 does not spring from the European heritage of Max Grundig…only the name is the same. Although I admire the Satellit 800 for what it does well (which is considerable) this radio has nothing at all to do with the original European Grundig company which marketed many high quality audio products, and its famous “Satellit” range of radios (“Satellit” is the proper spelling) beginning with the Satellit 205 introduced in 1964 through the model 700 which ceased production in 1996. 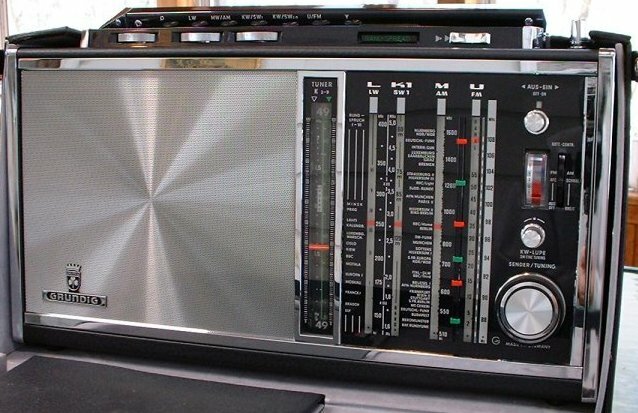 Interestingly I never saw too many Grundig or other European radios, and perhaps when I did I somehow didn’t lock into them as I would more familiar US and later Japanese manufacturers. I happen to belong to a small group of radio enthusiasts…yes you could call them fanatics… who have embraced the Grundig Satellit’s as among their favorite SW portable receivers ever made. Many are really too big to be considered portables and actually are better as large table top sets, but they all operate on batteries or AC power and have built-in antennas and handles so they can be carried around and taken outdoors and so are technically portable. To try to get up to speed on what the excitement was all about I bought a copy of Thomas Baier’s chronicle of the Satellit line, “Grundig Satellit – All Models In Word And Picture” (available through Universal). As I read the book and followed the history of this ambitious line of radios, the pride of German engineering which went into them became evident. Perhaps one of the reasons they weren’t imported into the US in greater numbers had to do with their price. 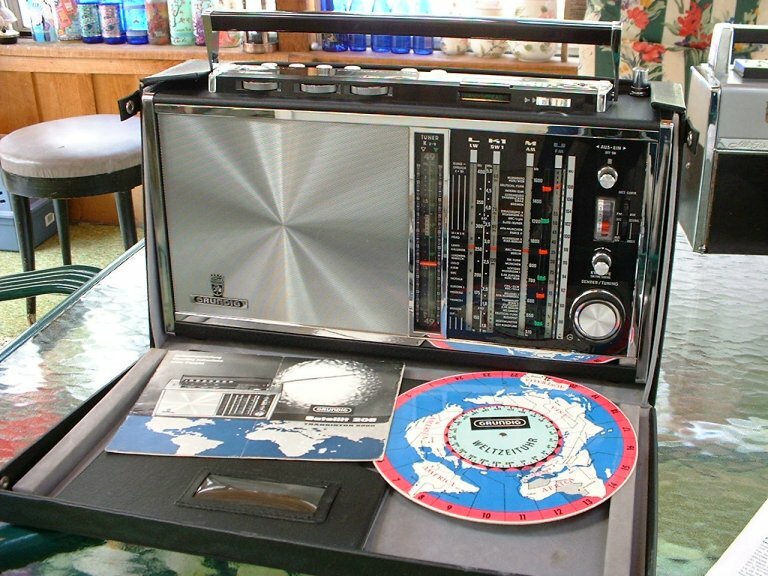 At a time when Zenith Trans-Oceanics were being highly promoted in print advertising and were considered premium radios selling for around $150, a Grundig Satellit would set an American customer back approximately $500 – $600! Part of the high cost was the fact that they were imported from Germany, but they were intrinsically more complex, more highly engineered instruments and were still a luxury item even in Germany. 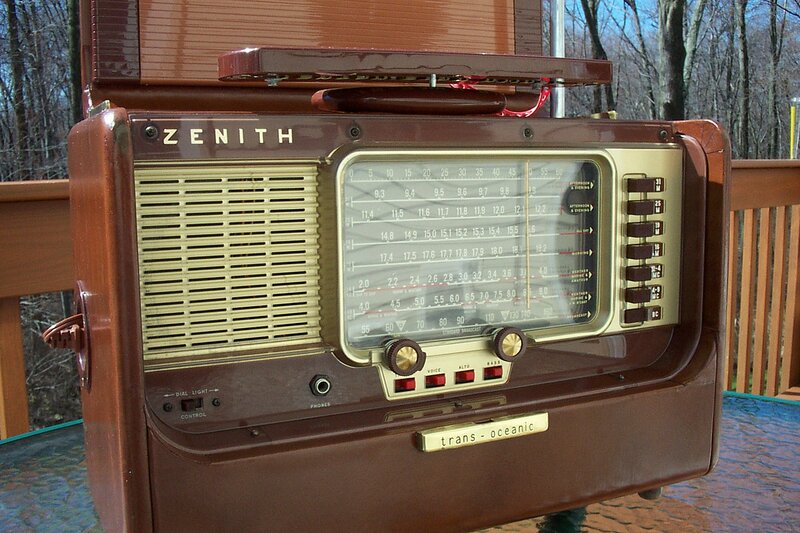 As a “Zenith Man” I will admit I’ve always been in love with Zenith’s better radios. From their acclaimed Royal 500 portable radio series of the 50′s and 60′s (the famous “Owl Eye” radio which survived several upgrades and is considered by many to the best radio of all time in its category), to the equally popular Trans-Oceanics, both tubed and transistorized models, I’ve never known of any other radio to outperform a top of the line Zenith in its size or price category…but now that opinion was being challenged. I began exchanging daily messages with these Grundig Radio experts and discovered some amazing things. First, these people are SERIOUS about collecting Grundig (and other) vintage radios. Some of them have many samples of each model, ranging from collector quality (which means absolutely perfect condition cosmetically…no signs of use, in the box with original papers) through “daily use” or “daily player” samples which are still very nice but show some normal wear and tear and are therefore of lower monetary value, even though they work properly. Some of these members have amassed collections of over 1500 radios, including all the popular brands…now that’s serious collecting in anyone’s book! The next amazing point was that, virtually unanimously, they all agree that the best Grundig Satellit radios are simply without peer for overall quality and pleasantness of use. These people didn’t form their opinions based on what they’re read…they based them on their own experiences, comparing hundreds of radios side by side. Although there are several other quality radios represented in the group, they poll themselves each year and overwhelmingly choose several Satellit models as the overall best radios ever in their categories. The most popular models include the Satellit 600/650 series, the Satellit 208/210 series, and the Satellit 700. Nice examples of these regularly bring prices between $300 to $500 and more depending on collector quality. As it happens a friend of mine owned a “junker” Satellit 210 (also known as the Transistor 6001) which he was willing to let me have for the price of shipping. “I tried it out and it works…kind-of…but nothing seems to hold steady…It keeps dying,” he explained. “Maybe you can fix it”. Well I surmised this was the typical old radio syndrome that anyone who collects old radios is amply aware of…dirty switches and controls which cause intermittent, erratic operation…maybe a bad connection or corrosion causing problems…or possibly some bad electrolytic caps. Especially if these units have been stored for years, it is a virtual certainty that, even if they were working when they were put into storage 20 years ago, they probably won’t work well now until they are serviced. When the radio arrived I was immediately struck by its beauty. This 1969-1971 design was a BIG, HEAVY portable radio measuring 17″ x 8″…hardly the kind of thing you’re likely to lug to the beach. You can move it from room to room fairly easily, but my guess is that most users will find a semi-permanent spot for it. Interestingly, Grundig had the habit of making its models available in many variant versions. Here’s quick run-down on this one. It was initially announced as the “Satellit 208″ or the “Transistor 6000″ depending on where it was sold. The so-called “National” model was called Satellit 208 and had countries indicated on the dial scales. 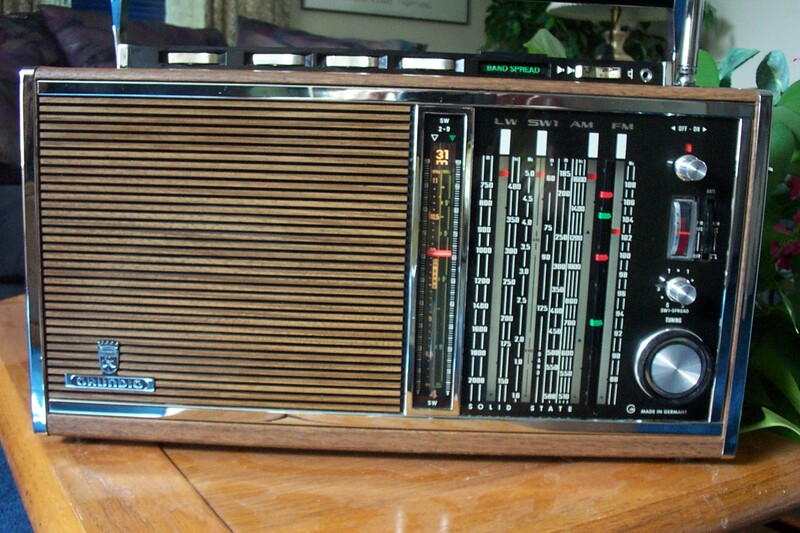 The “International” model was known as Transistor 6000 – although the radio says Satellit as well. These were followed by a slight upgrade…the Satellit 210/Transistor 6001…essentially the same radio with a few extra features to spruce it up a bit. The dial lighting could now be locked on permanently if you desired, an external antenna trimmer was added to peak reception in that mode, and a small circuit enhancement to aid stability was added creating at least a measurable improvement. There was also a third version known as the”210 Amateur” which dispensed with the standard shortwave broadcast bands and indicated the standard Amateur bands instead. But the variations didn’t stop there. Each model was available in either the then-standard black vinyl and chrome style or a so-called “Wood-Like” style. (Want to be more confused? Both models were actually built in wooden cases. The black vinyl and chrome were applied over the wood, while the ‘wood-like” model is faux wood, over plastic, over wood! Go figure…but at least each model boasts sound some say is warmer and richer due to the wooden box…and they may be right). Design & Layout: What Makes It So Special? I was initially struck by the obvious detail, quality and downright mechanical complexity of this radio. 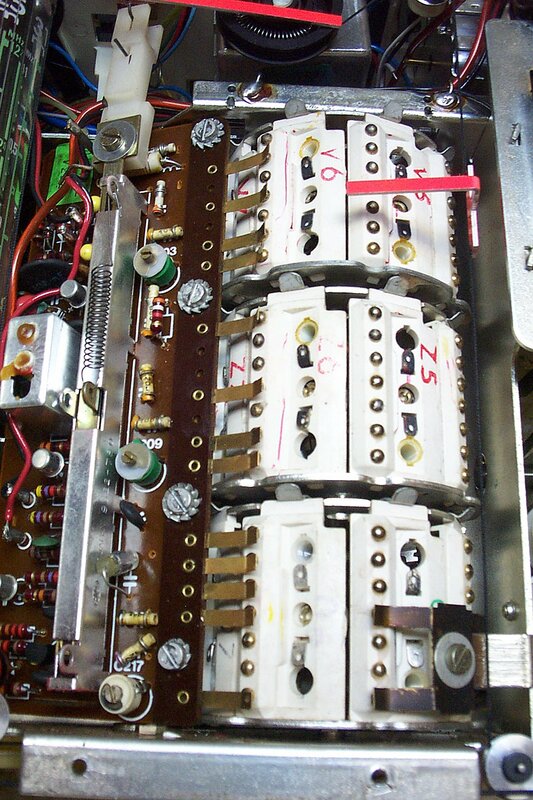 The right front of the front panel is dominated by 4 huge vertical dial scales, with separate areas for LW, SW-1, MW/AM and FM. Through a clever slip-clutch drive system, the main tuning knob only moves the FM dial pointer when the FM button is depressed. Push the MW/LW or SW-1 buttons and the same knob now turns that pointer. Very deluxe. And these are huge illuminated analog dial scales…6 inches tall. That’s impressive enough, but the coup de’ grace is Grundig’s unique Drum Tuner. What this system does is to divide the rest of the shortwave spectrum (from 5 MHz up) into 8 bands, selected on a vertical dial scale, which revolves with a knob at the right side, as in the solid state Trans-Oceanics – but with a few differences. In the Grundig, the actual tuner is a large rotating ceramic drum studded with gold plated contacts resembling an old TV tuner drum and sporting alignment adjustments for each band. . This drum is connected to the visible rotating drum which displays the shortwave bands 2 – 9 in a separate vertical window to the left of the main dial area…again, they are just about 6 inches tall. But, as they say…”Wait…there’s more!” Within each of those 8 sw bands are actually two bands…a continuous coverage band on the left and a spread band on the right. So, for example, if you select SW2…the 49 meter band, you can tune between 5.0 to 7.1 MHz in the Continuous mode, or press a button to stretch the band to tune only 5.95 to 6.25 MHz within that same 6 inch expanse. This means you can tell exactly what frequency you are tuned to and, as far as I know, is a first among analog-tuned portables. I was absolutely blown away by the superb accuracy of the analog tuning on this Grundig. In many cases you can tune in a frequency with the radio turned off and when you hit the power, there it is. This wonderful and unique system was retained throughout the Satellit analog line. 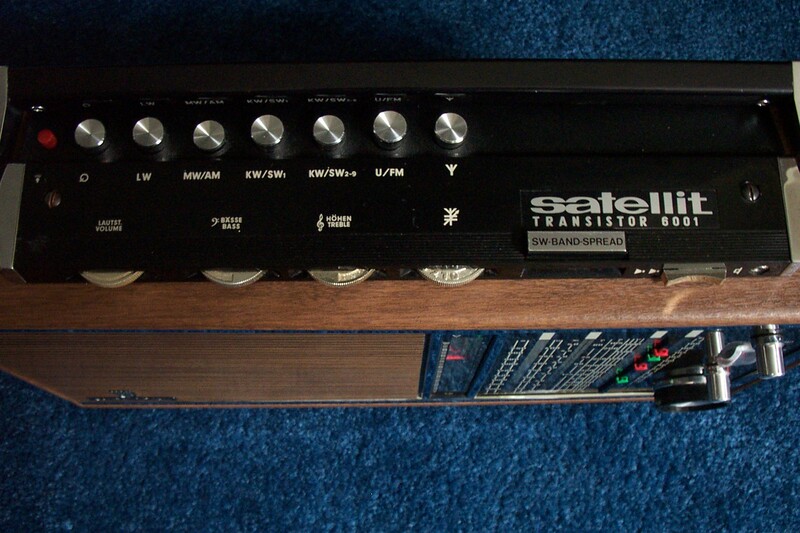 Why is this one of the most respected of all the Satellit’s among the Grundig collectors? First, it’s an analog-tuned design and many people still prefer a good analog radio to any digital radio. The virtues of analog are smooth tuning, no muting or chuffing while tuning and a natural, instinctive feel that makes it easy to navigate through the frequency ranges quickly yet in detail. It also boasts amazingly long battery life…it’s 9 D cells will power the Satellit 210 for months of average, even heavy use. And some of the more superstitious still believe no digital receiver can match an ultimate analog tuner for a low background noise floor. I won’t take a position on that…I’ve always felt that either design could produce excellent results and my collection of digital and analog radios seems to bear that out. But the Grundig experts cite this model as being the most sensitive SW portable ever made…period! It is also the last Satellit to be made in a real wooden box…many knowledgeable radio folk feel a wood box imparts a fullness or warmth you just can’t get in a plastic box. I was ready to learn…this European/Grundig designed radio was all new to me; nothing at all like any Sony or Zenith I ever saw. It is as different on the inside as it is on the outside. I found this monster PACKED with complex mechanical linkages, a toothed belt, three dial strings, that tuning clutch I described earlier and an amazing maze of switches and alignment points…clearly this was not like any radio I’ve looked inside before. My tubed and solid state Trans-Oceanics are almost simple by comparison. That’s both good and bad as you are about to see. As it turned out I was not able to fully revive that free radio. 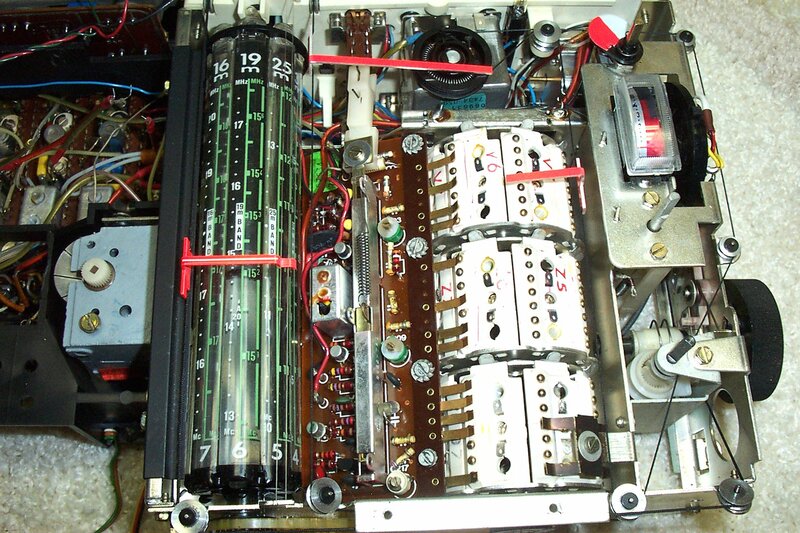 Its problems extended beyond the traditional blown transistors, weak capacitors, switch cleaning, dial restringing and alignment repairs. Previous abuse had left it in need of some key parts which I had no source for. It’s unfortunate that I didn’t discover the extent of its problems until I had spent the better part of a morning restringing one of the dials…without a doubt one of the most harrowing dial stringing jobs I have ever done…and I’ve done many. 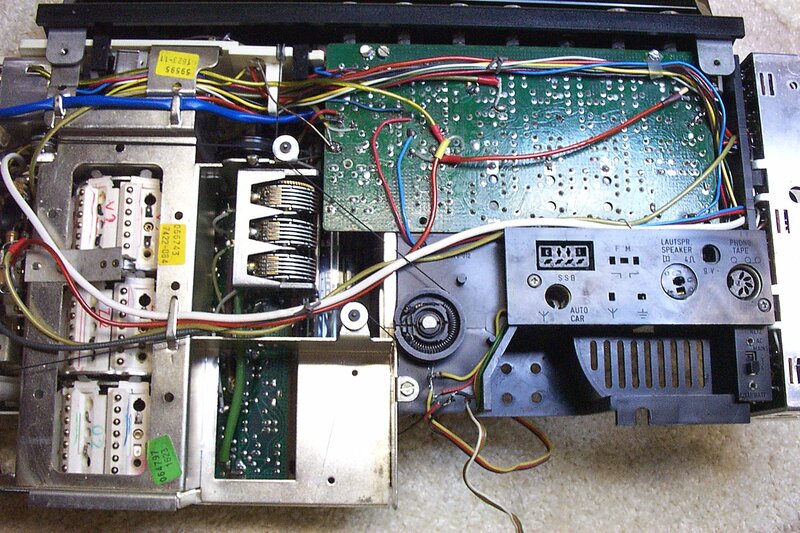 This is one of the prices of complexity…portions of the disassembly for repair are a nightmare on this radio. Also the service manuals are a far cry from what I am used to. The German edition of course presents some problems for me. Even the English version I found was a very poor copy, and both omit many key areas of information generally available in service manuals, leaving much more to guesswork and familiarity with the model only someone who worked for Grundig at the time is likely to have. The rest of us are left to figure things out on our own and to learn through experience, and even to fabricate a dial alignment template to align the dials when the radio is disassembled. That is a big frustration to someone like me who traditionally buys radios in need of help (so I can get them at a good price) and then enjoys fixing them up and restoring them. I was now on the lookout for a nicer sample…one I could actually use and enjoy, and hopefully figure out why those Grundig collectors value this radio so highly. I figured I would stick with the same model as the junker would now become my “parts set”. I bought one at a lowball price but it didn’t seem to be the stellar performer this model is supposed to be. The seller graciously took it back with no problems. I ended up finding a nice “play quality” radio wood-like sample on eBay at a reasonable price. The collectors call them “Woodies”, like the old wood sided station wagons. To me this radio was even more visually striking than the black/vinyl version. The Teakwood toned cabinet was set off by ample black plastic and chrome and those huge colorful dials with bright illumination are aesthetically gorgeous. The radio did need the routine control and contact cleaning. It was almost useless as received, even though the seller had described it as working perfectly. From what I’ve learned of old radios, I believe him…the age and mechanical complexity of these old analogs makes them likely to be knocked out of adjustment or to have components jostled during shipment. On this one, though, a simple control cleaning and some miscellaneous mechanical adjustments brought the radio right back to life. One of the first things that struck me about the Satellit 210/Transistor 6001 was its big, possibly excessive bass response. Tuning into some nostalgic shows on AM like “Sounds Of Sinatra” or “Doo Wop Express” this radio produced an extremely lush tone quality. 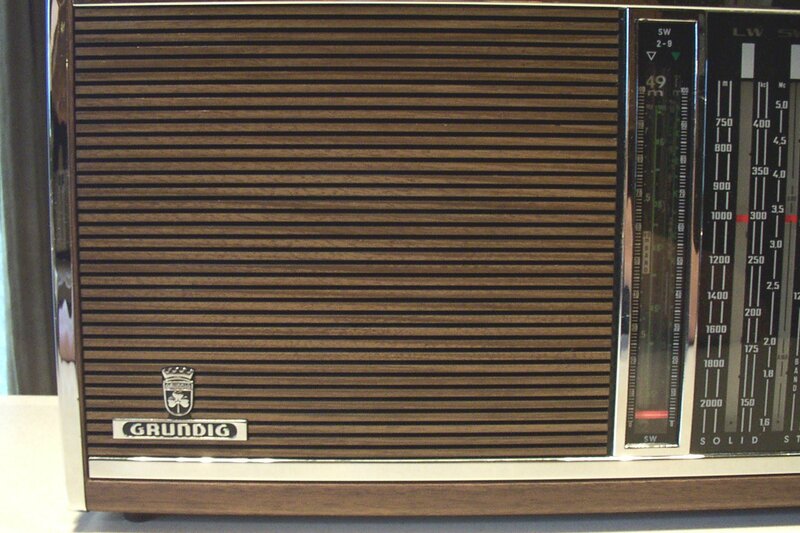 I had finally heard the legendary “Grundig Sound”. It sounded like a vintage tubed radio twice its size…smooth…mellow…relaxing…perhaps even a tendency toward too much bass but unfortunately not much sparkle on the top end (on AM and SW). The signals were all very listenable…fades seemed less bothersome…it just sounded full and rich. I can see why people love this sound and it can be seductive…for me it is a bit bloated in the mid-bass compared with other radios which also offer a bit more high end clarity. But how was its shortwave reception? In a word…superb. I compared it side by side with my best shortwave portables. I went into these comparisons expecting to find the Satellit 210 to be excellent, but I did not expect that it would be as good as the best on shortwave, but it was. Testing each radio as a portable, using its own whip antenna, the Satellit 210 consistently matched or outpointed the competitors. I very much enjoyed tuning around with the old Grundig too. I found that by staying within the spread bands I could find most of what was on the air quickly, but I could also revert to the continuous mode and scan outside of the bands as easily as within them. I also was amazed at the analog dial accuracy on shortwave of this radio after I had aligned it…at the top and bottom of every shortwave band and in both modes the dial calibration was exact. That is something I truly appreciate in an analog radio. The 210 also has excellent AGC characteristics which helps to make fading signals more listenable than on many other radios. In actuality as I got to know the radio better I began to identify some aspects of the sound I didn’t like as much as I did at first and this has to some extent put me at odds with the Grundig lovers (although we kid each other about this as we are all friends). The 208/210 actually has a bloated bass which can distort if not reined in by use of the bass control. It also has a bit of a roll-off in the higher frequencies on AM and SW, and if you advance the treble control to compensate for this you get a bit of a peak in the midrange. Nevertheless the sound lacks a bit of crispness I hear on many other radios. I can understand the romantic nature of this sound, in some ways like a scaled-down jukebox, and sometimes it can be very pleasant, but it is a bit less accurate than it could be. It tends to enhance shortwave listening however, especially with poor quality signals, but I note that Grundig changed this sound characteristic on their following models, in favor of a more traditional audio characteristic. The AM reception is very good… I tried several samples and although they were consistently top tier on SW they vareid more on AM reception. The best of several earned a rank of four stars in my AM Mega Radio Shootout. The real strength of the Satellit 208/210 is its shortwave reception…I’ve had a few portable radios which match it on SW but none that have beat it. I have always found it difficult to choose a favorite radio because every radio has its own strengths and weaknesses. For example, my Satellit 800, even though it’s not heavy and complex in the tradition of the “real” European Grundigs of old, especially the Satellit 600/650 which it resembles, and even though it doesn’t have quite the warm, lush sound of the older Grundigs, does have an audio clarity which the SAT 208/210 lacks. It also has several modern advancements which can really improve reception, especially with an external antenna, which is the way I use that radio. Things like Fast/Slow AGC, Sync capability, SSB, three bandwidths, wide rf dynamic range…all work to help the 800 clean up some signals that would otherwise be unlistenable. The Satellit 800 still sits in my den, connected to my external antenna, and an Eton E1 sits on my nightstand, while the Satellit 210 excels when used as a portable, where its extreme sensitivity off the whip and its ease of use as a casual bandcanner make it a fun radio to take out onto the deck on a cool summer evening. As for serviceability of the Grundig, I think an analogy to a sports car is appropriate…it may require more care and feeding in exchange for cutting edge performance in some areas. So, is the Satellit 208/210 the “best” SW portable there is? No. But what radio is? Hmmm. Mix one part Grundig with one part Sony, one part Zenith and add a dash of Panasonic and GE. Shake well. I guess the “perfect” radio has yet to be made.